Beautiful, eye-catching Bracelet made of semiprecious Ice Crystal Extremely impressive and shiny jewelry !!!! MATERIALS: Balls made of semiprecious stone - an ice crystal with diameter 12mm and 8mm. Bracelet is based on a silicone rubber. DIMENSIONS: Fits on the wrist with a circumference of 15,5cm to 17cm. EXTRA OFFER: You can order a bracelet to the specified measurements. FREE service! 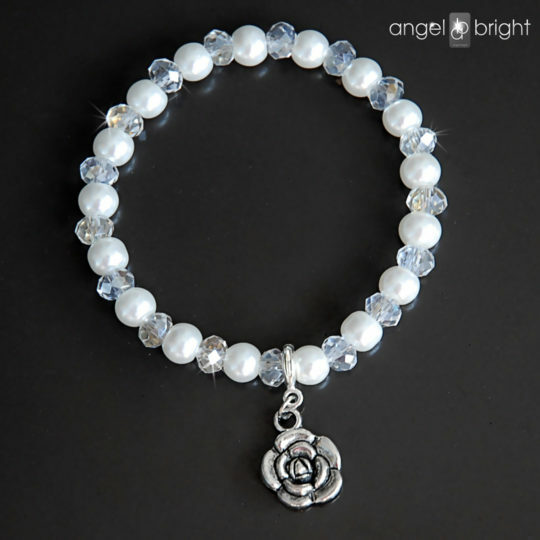 Bracelet Crystals and Pearls "Charms Flower" – is a beatufull bracelet made of crystals and pearls. Crystals shine beautifully and sparkle in the light with all the colors of the rainbow. Pearls are classic and timeless beauty! MATERIALS: beads crystals with a high-quality cut of 6 mm in the color of crystals iridescent, white glass pearls with a diameter of 6mm. Beautifully shaped pendant – metalwork of antiallergic materials. Bracelet is based on a silicone rubber. It is easy to apply and pulls. DIMENSIONS: Fits on the wrist with a circumference of 15,5cm to 17cm. Additionally, we offer:: You can order a bracelet to the given size. Service FREE! 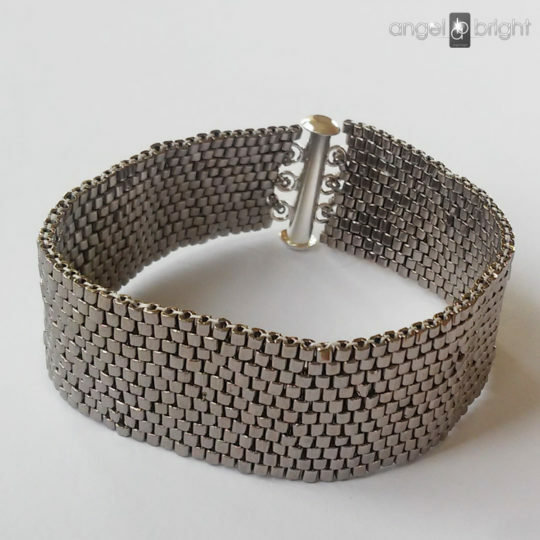 Bracelet made of glass crystals in silver and gray shades. Extremely impressive and shiny jewelry!!! MATERIALS: Crystals in an oval shape and minty, graphite colors, TOHO beads in silver, round hematite stones. Earrings finished with sterling silver earwires. MEASUREMENTS: Bracelet length: 16,5cm plus 4cm of extender chain. Width: 2,5cm EXTRA OFFER: You can order a bracelet to the specified measurements. FREE service! 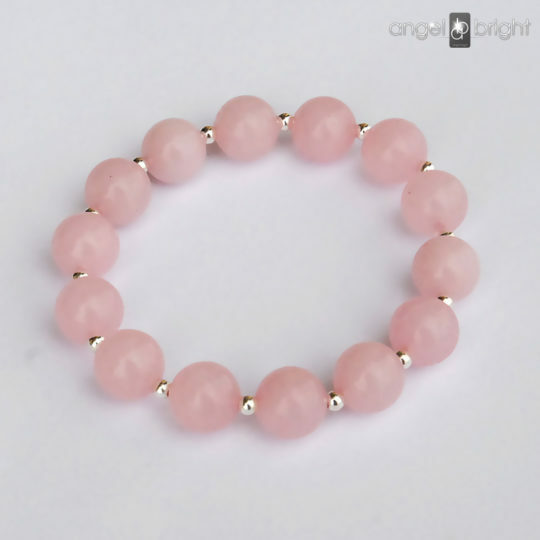 Beautiful, eye-catching Bracelet made of semiprecious Rose Quartz. Extremely impressive and shiny jewelry !!!! MATERIALS: Balls made of semiprecious stone - a Rose Quartz with diameter 10mm and sterling silver beads. Bracelet is based on a silicone rubber. DIMENSIONS: Fits on the wrist with a circumference of 15,5cm to 17cm. EXTRA OFFER: You can order a bracelet to the specified measurements. FREE service! A bracelet in the shape of a strap, carefully braided with small glass beads in old silver colors. Extremely impressive and shiny jewelry !!!! MATERIALS: TOHO beads in cube shape and old silver colors. Bracelets closure ended with a slide- magnetic lock, plated-silver. MEASUREMENTS: Bracelet length: 16,5cm Bracelet width: 1,8cm EXTRA OFFER: You can order a bracelet to the specified measurements. FREE service! Earrings made of white glass pearls and glass crystals. Pearls are classic and timeless beauty! MATERIALS: Crystals (transparent) in a diamond shape with AB effect and white glass pearls with a diameter 4mm, hanging drop 1,5cm long, Toho tiny beads in silver colors. Earrings finished with sterling silver elements. MEASUREMENTS: Earrings – 5,5cm without earwires. EXTRA OFFER: We offer earwires to choose from: open earwires, closed English and studs with hanging earrings (shape like in the picture). Earrings can also be ordered on clips. Please let us know in a message during purchasing the product. Beautiful, eye-catching bracelet and earrings in black and silver. 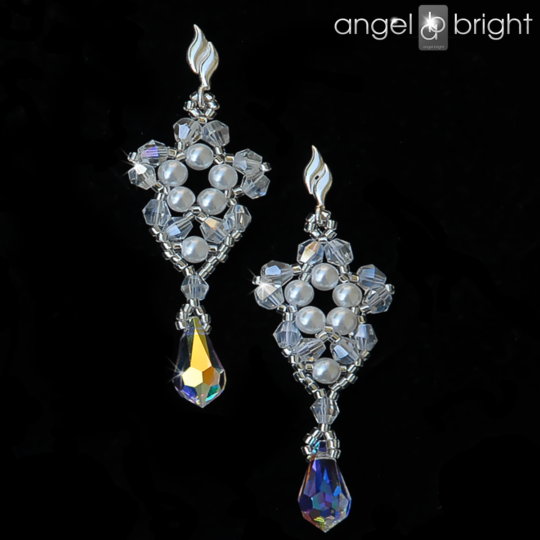 Carefully braided with luxurious Swarovski crystals of excellent cut quality. Extremely impressive and shiny jewelry !!!! MATERIALS: Swarovski crystals 12mm, 16mm and 4mm, TOHO beads in silver, black and graphite colors. Earrings are hanging on English earwires. Bracelets closure ended with a lobster lock and extender chain – sterling silver. MEASUREMENTS: Earrigns: 7,5cm without earwires. Bracelet length: 20cm plus 4cm of extender chain. EXTRA OFFER: We offer earwires to choose from: open earwires, closed English (shape like in the picture) and studs with hanging earrings. Earrings can also be ordered on clips. Please let us know in a message during purchasing the product. You can also order a bracelet to the specified measurements. FREE service! Beautiful, eye-catching bracelet and earrings in violet and light peach. Carefully braided with luxurious Swarovski crystals of excellent cut quality. Extremely impressive and shiny jewelry !!!! MATERIALS: Swarovski crystals 14mm, 16mm, 6mm and 4mm, TOHO beads in silver and light peach colors. Earrings are hanging on English earwires. Bracelets closure ended with a lobster lock and extender chain - sterling silver. MEASUREMENTS: Earrigns: 5,5cm without earwires. Bracelet length: 20cm plus 4cm of extender chain. EXTRA OFFER: We offer earwires to choose from: open earwires, closed English (shape like in the picture) and studs with hanging earrings. Earrings can also be ordered on clips. Please let us know in a message during purchasing the product. You can also order a bracelet to the specified measurements. FREE service! Beautiful, eye-catching bracelet and earrings in silver-graphite. Carefully braided with luxurious Swarovski crystals of excellent cut quality. Extremely impressive and shiny jewelry !!!! MATERIALS: Swarovski crystals 14mm, 16mm, 6mm and 4mm, TOHO beads in silver and graphite colors. Earrings are hanging on English earwires. Bracelets closure ended with a lobster lock and extender chain - sterling silver. MEASUREMENTS: Earrigns: 5,5cm without earwires. Bracelet length: 20cm plus 4cm of extender chain. EXTRA OFFER: We offer earwires to choose from: open earwires, closed English (shape like in the picture) and studs with hanging earrings. Earrings can also be ordered on clips. Please let us know in a message during purchasing the product. You can also order a bracelet to the specified measurements. FREE service! Beautiful, eye-catching bracelet and earrings in blue. Carefully braided with luxurious Swarovski crystals of excellent cut quality. Extremely impressive and shiny jewelry !!!! MATERIALS: Swarovski crystals 14mm, Chech crystal beads 4mm, TOHO beads in blue and sapphire colors. Earrings are hanging on English earwires. Bracelets closure ended with a lobster lock and extender chain – sterling silver. MEASUREMENTS: Earrigns: 5,5cm without earwires. Bracelet length: 20cm plus 4cm of extender chain. EXTRA OFFER: We offer earwires to choose from: open earwires, closed English (shape like in the picture) and studs with hanging earrings. Earrings can also be ordered on clips. Please let us know in a message during purchasing the product. You can also order a bracelet to the specified measurements. FREE service! 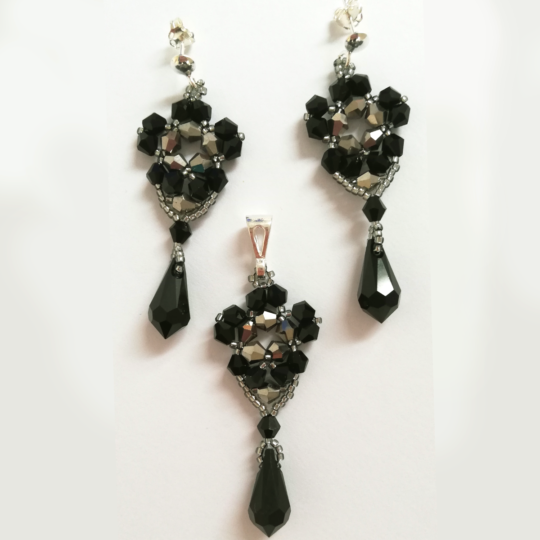 Earrings and pendant made of black and silver glass Chech crystals. Extremely impressive and shiny jewelry !!!! MATERIALS: Crystals in a diamond shape with a diameter 4mm, hanging drop 1,5cm long, Toho - tiny beads in silver colors. Set finished with sterling silver elements. MEASUREMENTS: Earrings and pendant – 5,5cm without silver endings. EXTRA OFFER: We offer earwires to choose from: open earwires, closed English and studs with hanging earrings (shape like in the picture). Earrings can also be ordered on clips. Please let us know in a message during purchasing the product. Bracelet and earrings made of black and silver glass Chech crystals. Extremely impressive and shiny jewelry !!!! MATERIALS: Crystals in a diamond shape with a diameter 4mm, Toho - tiny beads in silver colors. Bracelet finished with sterling silver elements. MEASUREMENTS: Bracelet lenght – 16,5cm and width 2,6cm Earrings and pendant – 5,5cm without silver endings. EXTRA OFFER: We offer earwires to choose from: open earwires, closed English and studs with hanging earrings (shape like in the picture). Earrings can also be ordered on clips. Please let us know in a message during purchasing the product. You can also order a bracelet to the specified measurements. FREE service! Beautiful, eye-catching bracelet and earrings in white and silver. Carefully braided with luxurious Swarovski crystals of excellent cut quality and white pearls. Extremely impressive and shiny jewelry !!!! MATERIALS: Swarovski crystals 14mm and white pearls 4mm, TOHO beads in silver and white colors. Earrings are hanging on English earwires. Bracelets closure ended with a lobster lock and extender chain – sterling silver. MEASUREMENTS: Earrigns: 3cm without earwires. Bracelet length: 20cm plus 4cm of extender chain. EXTRA OFFER: We offer earwires to choose from: open earwires, closed English (shape like in the picture) and studs with hanging earrings. Earrings can also be ordered on clips. Please let us know in a message during purchasing the product. You can also order a bracelet to the specified measurements. FREE service!